Logging On with Passfaces takes just a few seconds, You are presented with a 3 by 3 grid, one at a time, for each assigned Passface. Pick your Passfaces out of those presented and click on it. Repeat this step until all of your Passfaces are selected. That completes the log on. If you pick the wrong face during log on, you will not be alerted until you have picked all of your faces. At that point, you will be asked to start log on again. 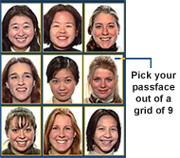 Alerting you in advance of moving to the next face makes it very easy for anyone to guess your Passfaces.